Joomla is horrible. I already developed a prototype using ProcessWire, which I also use for my other website projects. It's simple and extensible, and has an excellent built-in search function as well. The basic structure is not much of a problem (the prototype is fairly complete), it's just that filling it in is rather time-consuming. Currently, I am working on finishing Henchmen of Ares, preparing the next issue of Ancient Warfare, and doing some assorted stuff; I should have more time later in September/October. Sadly, no. It's a prototype and I dare not release it at this stage, since some stuff will undoubtedly be changed and it's rough around the edges. I just installed PW and play about with it. So then, what next? The form of the data and the info to go with it are all depended on how the DB works... You could upload it someplace and forbid access to visitors? Umm folks, sorry for necro-ing this thread but since my question is very related to helmets, may I ask a question? The Boeotian helmet was the only helmet used by the hoplites whose contemporary name was known to us right? How about the other helmets? Were there any clues as to what their contemporary names were? If not, then let's go into the realm of...fantasy doesn't sound like the right term to use so let's use speculation instead. What was the most likely name that would've been given to the Corinthian helmet by the Persian Wars era Greeks? The boeotian is not the only ancient name that comes to us. The corinthian is indeed mentioned by Herodotus. The boeotian is mentioned and described by Xenophon. Some helmet types also fall in the same category as some hats, from which they evolved. So the laconian pilos may some times reffer to a bronze helmet, and some times to felt caps. The same goes for the boeotian pilos, which may have evolved into the more elaborate boeotian helmet by the time of Xenophon and Alexander. 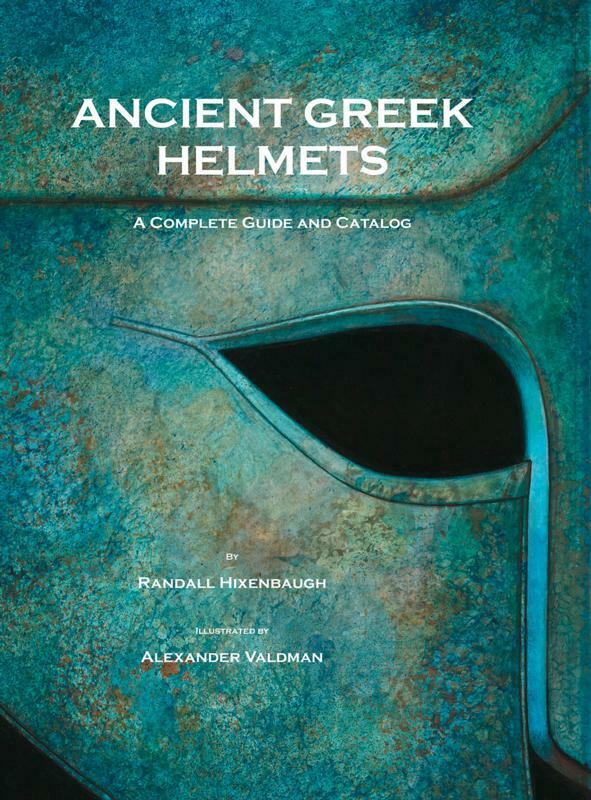 Hixenbaugh Ancient Art is pleased to announce the release of the new book by Randall Hixenbaugh and Alexander Valdman: Ancient Greek Helmets: A Complete Guide and Catalog. The book is the most comprehensive study ever produced on the subject of ancient Greek armor, tracing the development of the ancient Greek helmet from the Bronze Age through the Hellenistic Period, delving into design, function, iconography, metallurgy, and the impact of Greek military technology on the world. The book catalogs over 2100 ancient Greek helmets in both public and private collections, with hundreds depicted in brilliant full color original illustrations. The book release is conjunction with the current gallery exhibition, ANCIENT GREEK HELMETS. The exhibition includes over a dozen authentic ancient Greek helmets in a variety of designs spanning a period from 600 BC to 100 BC. It is an exhibition that rivals the finest museum collections, representing each of the distinctive ancient Greek helmet forms spanning the entire period of their production and use on the battlefield. Also on view are the original painted gouache illustrations of ancient Greek helmets from the book by artist Alexander Valdman. Hixenbaugh Ancient Art’s exhibition “ANCIENT GREEK HELMETS” is currently on view in our Chelsea gallery through April 30th.